YTL Land & Development Bhd, the property arm of YTL Corp Bhd, says its priced development in Sg Besi, Kuala Lumpur, called Lake Fields has taken the company to new heights, as it has set a new price standard for properties in the area. "Lake Fields has demonstrated Sg Besi's potential as Kuala Lumpur's next property hotspot," YTL Land executive director Datuk Yeoh Seok Kian told Business Times. 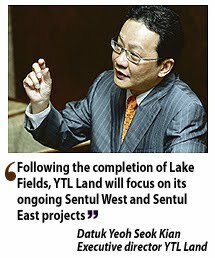 Lake Fields, a joint-venture by YTL Land via Syarikat Pembinaan Yeoh Tiong Lay and the Employees Provident Fund, spans 74ha and the centrepiece is a 6ha lake. The first phase, known as Meadows & Glades, launched in 2005, were snapped up overnight. The three-storey homes were priced from RM380,000 per unit and they are now worth around RM665,000. YTL Land recently had a preview for the second phase known as Dale, which sold out in four days. The RM300 million Dale project comprises 343 units of three-storey semi-detached homes and the prices range from RM638,800 to RM1.33 million. More than half of the units were snapped up on the first day of preview on August 25 by existing buyers of YTL Land's other projects such as Sentul East, Sentul West, Lake Edge and Pantai Hillpark. Dale saw over 4,000 registrants and the preview was held on a first-come, first-served basis. The key point for Dale is the double-volume living area with floor-to-ceiling windows. It has five bedrooms including one with an en suite bathroom on the ground floor for the elderly. YTL Land will launch phase three soon, known as the Groove, worth over RM300 million. The price of the homes here will be higher than Dale. The three-storey homes feature a built-up of more than 4,000 sq ft and comes with a private lap pool and rooftop garden. Yeoh said following the completion of Lake Fields, YTL Land will focus on its ongoing Sentul West and Sentul East projects in Kuala Lumpur, its flagship development.